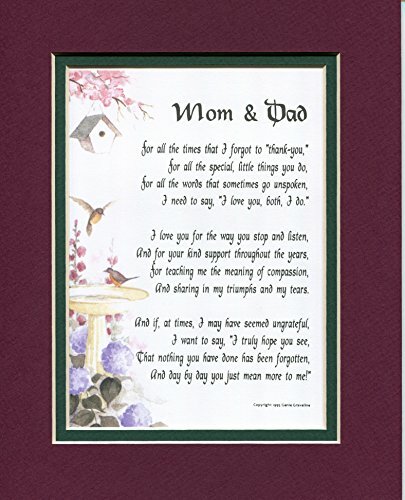 Special Mom and Dad Gift for your Parents with "Thank You Mom and Dad" Poem. Mts Sunset Photo, 8x10 Double Matted. 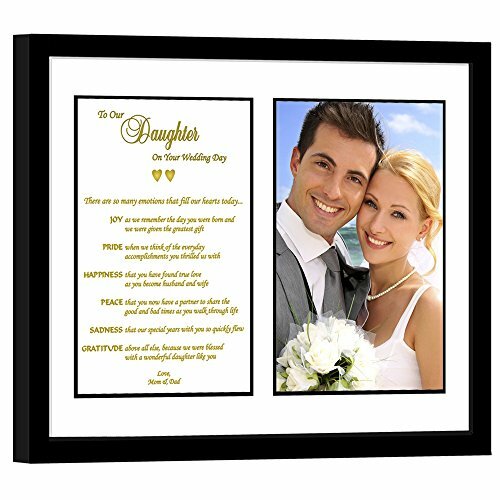 Father and Mother - Parents Gift for Christmas, Wedding, Great Appreciation Gift. A special gift for your mom and dad. Your parents will appreciate and love this gift. 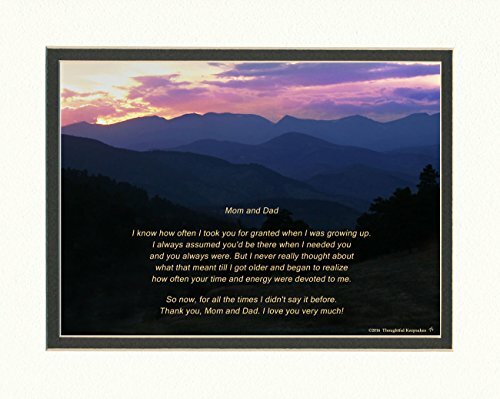 This beautiful photo of multi-colored layers of mountains with a spectacular sunset includes the poem: Mom and Dad (above the poem) I know how often I took you for granted when I was growing up. I always assumed you'd be there when I needed you and you always were. But I never really thought about what that meant till I got older and began to realize how often your time and energy were devoted to me. So now, for all the times I didn't say it before. Thank you, Mom and Dad. I love you very much!Thoughtful Keepsakes is an independently owned small business that takes pride in our products. The company was started by the owner, Penny, who photographs and designs all the products and now writes most of the poems. We give excellent customer service and a 100% satisfaction guarantee. The photo size is 5 1/2" by 7 1/2" and includes an 8"x10" double mat as viewed. Printed with high quality photo paper and ink. No-frame included. Will fit in any 8"x10" frame that allows space for a double mat but not-a-photo-frame that fits only one piece of photo paper. To view all our gifts by category just put your cursor on "Thoughtful Keepsakes" and then click on our "Storefront". Brought to you by Lucky Tusk Co. and Paper Metal Canvas. 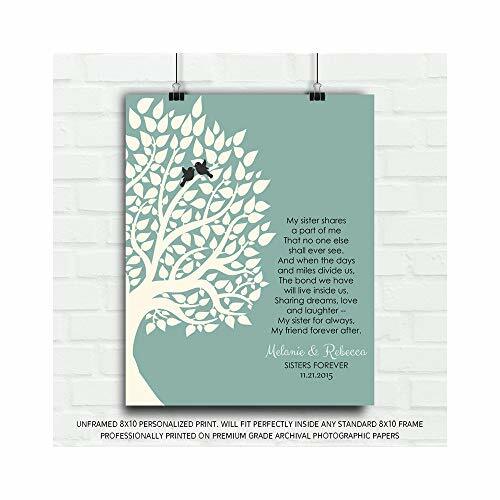 This is an 8x10 unframed personalized art print, professionally printed on archival grade photographic paper with your personalizations included. Arrives securely packaged inside a cellophane sleeve within a sturdy shipping flat. Ready to be framed in any standard sized 8x10 frame.This personalized piece makes an extraordinary gift for someone special. It is a lifetime gift that will keep on giving, day after day. Looking for more customization options, larger sizes or other print mediums? 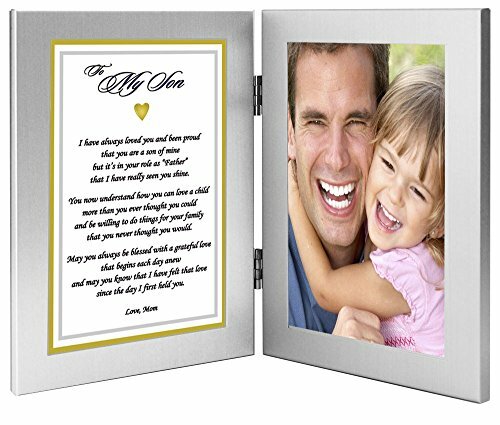 Please visit our shop or contact Paper Metal Canvas directly for more information or to ask additional questions. © Lucky Tusk Co. | Paper Metal Canvas * Artworks that contain the look of particular metals, fabric surfaces or textured papers are faux created, artistically drawn backgrounds, which are then printed onto a smooth surface. Brand: Paper Metal Canvas & Co. This is a double-matted, 8x10 poem, enhanced with delicate watercolor graphics. It is a beautiful gift for your parents. Something which they will treasure forever. It would be appropriate to give them on their anniversary, or for any other occasion. 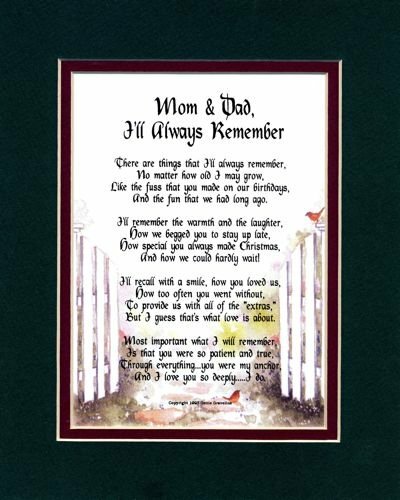 The words to the poem are: "Mom and Dad, I'll Always Remember" There are things that I'll always remember, ...No matter how old I may grow, ...Like the fuss that you made on our birthdays, ... And the fun that we had long ago. ... I'll remember the warmth and the laughter, ...How we begged you to stay up late, ... How special you always made Christmas, ...And how we could hardly wait! ... I'll recall with a smile, how you loved us, ...How too often you went without, ...To provide us with all of the "extras," ...But I guess that's what love is about. ... Most important what I will remember, ...Is that you were so patient and true, ...Through everything...you were my anchor, ...And I love you so deeply...I do. 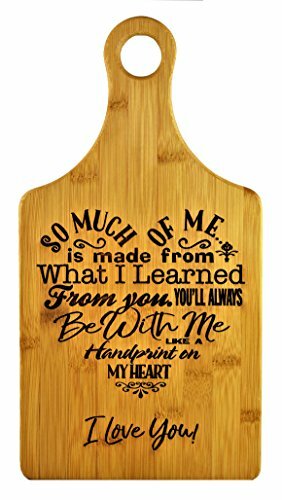 ✔ SEE OUR OTHER GREAT GIFT IDEAS HERE ON AMAZON ~ ENGRAVED PICTURE FRAMES, CUTTING BOARDS AND MORE: for Dad, Mom, Family, Friends Grandma, GiGi, Nana, Grammy, Grandpa, Gramps, Pop-Pop, Poppy, Coach, Best Hunting Dad Ever, Best Mom Ever Gifts, Housewarming, Graduation, Christmas, Birthday, Valentine's Day, Flasks and more! Click above on (GK Grand Personal-Touch Premium Products) to see our many great gift ideas! There is no other kind of love than the love that your mother provides. 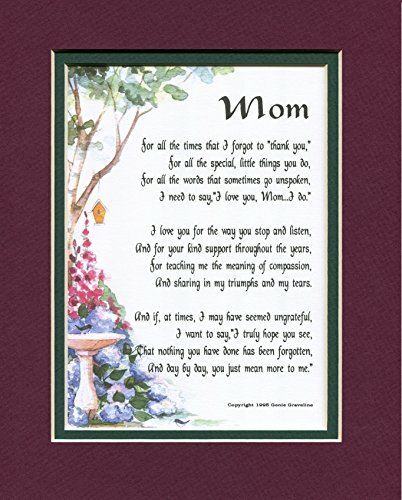 For Mother's Day - or any day - show her how much she means to you with this custom mother poem stone plaque made just for her. Feel this way about someone other than your mom? 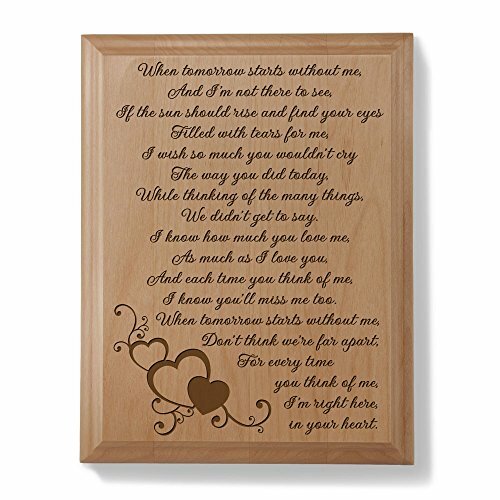 This beautiful poem keepsake plaque can be personalized with any title and will be finished off with your two-line custom message. Each plaque is made of tumbled stone - which provides an antique, crackled look - and has its own variations in texture and edge. 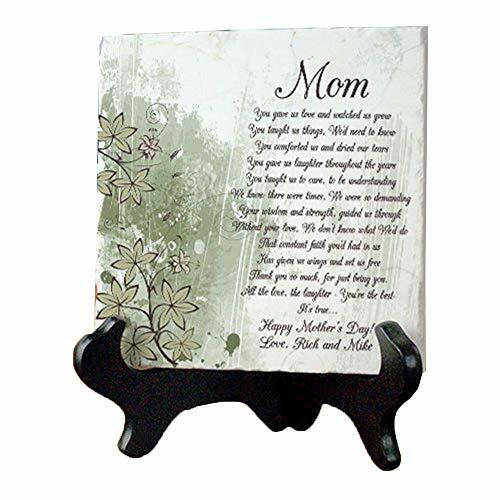 It measures 6" x 6" and includes a stylish black wood easel for a beautiful presentation.